Member of the Bromeliaceae (pineapple family). Native to Southeastern US to Chile and Argentina. Family relatives include Billbergia, Cryptanthus, Aechmea, Guzmania, pineapple and Puya. Silvery-gray threadlike masses to 25 ft. long, classed as a monocotyledon. Densely covered by gray scales, which are a means of receiving and holding atmospheric moisture making roots unnecessary. Very small axial flowers with petals 3/8 in. (1 cm) long, in changing colors yellowish-green to blue, the plant is an epiphytic perennial. 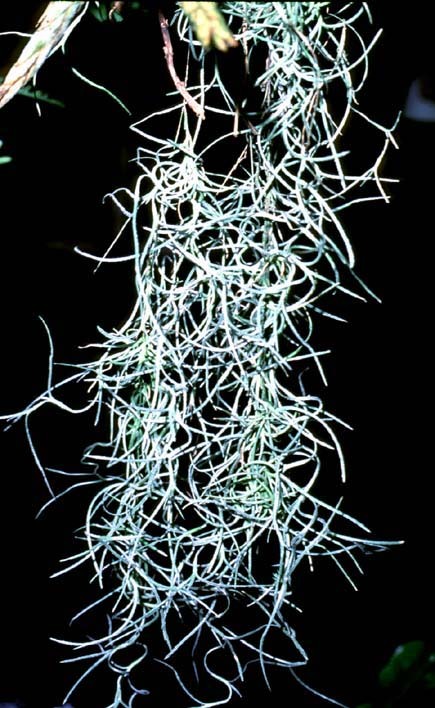 The genus name, Tillandsia, derives from the name of a Swedish scientist, Elias Tillands, a professor of medicine at the University of Abo, who catalogued the plants around that town in 1673. Native Americans called the plant “tree hair”, which name the French explorers turned to “Barbe espagnole” — “Spanish Beard” — to insult their bitter rivals in the New World. The Spanish retorted with “Cabello franc”s” (“French hair”). “Spanish Moss”, a milder variation of the French taunt, has survived. Another common name is “Graybeard”. According to legend, a Spaniard was in love with an Indian chief’s daughter. The chief did not approve and had the Spaniard strung up in a tree until he renounced his love. The Spaniard refused, died in the tree, but his beard continued to grow from the tree’s branches as a sign of his undying love. Most commonly seen naturally growing on tree branches. Bessler et al. (1998) showed that light stimulate ethylene production for this species.